A Motion Sensor is an essential part of your ADT monitored security system when the system is armed in the away mode. You do not arm the motion sensor when you are home. 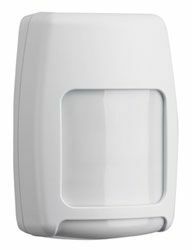 A motion sensor provides a second level of protection if an intruder is able to get past the perimeter protection without being detected. You should think of a motion sensor as a trap zone. Most burglars are headed for the master bedroom were most people have their jewelry, cash hidden, watches, guns, etc. The motion is setup as a trap zone typically in the hallway leading to the master bedroom in one story or the stairway in a 2 story home. A motion sensor is an important part of every security system and at least one should be installed with your home or business security system. Many homeowners have two or three ADT motion sensors installed. Typically one in the hallway or stairway, one in the master bedroom and one in a living area with a lot of windows. It can also be benefically to install wireless motions sensors in detached garages, sheds, etc. A motion that is not part of the inside of the home can be alarmed in stay and away mode. If you would like back up protection from the door or window sensors while you are home or if you large dogs that freely roam your home, you may consider adding some glass break sensors for added security and protection. People ask about whether pets will set off a motion sensor. Most home security system have motions that are pet immune from 30 to as high as 80 pound pet immune motion sensors. Small cats and dogs will not trigger the motion, but you cannot have a large dog roaming the house with the motion armed or it will trigger an alarm event. If Spot or Rover are large dogs it may be to your advantage to put a motion in your master bedroom and shut the bedroom door. This provides a second level of protection in the most vulnerable area of your home while allowing Rover to stay inside when it’s raining and cold. It’s not a good idea to eliminate the motion completely if you have large dogs. If you take your dog to the park or for a walk, go on vacation and the leave your dog with a friend you will want to have a motion sensor for interior protection of your home. Motions can protect a complete area of your home and possibly reduce the cost of arming multiple windows. For example, if you are most concerned with having added protection when you are away from the home and your family room, living room or dining area have banks of windows right next to each other, you can use a motion sensor to protect the whole area from intrusion. The motion sensor will detect a burglar entering through any of the window openings in the entire area. Most motions used for home alarm systems have a range of between 25-40 ft and almost cover a 90 degree area. That is why you see many motions installed in a corner. Tip: If you have a wireless motion the small light on the motion sensor will not go on and off when you move in front of the sensor unless it is in test mode. When the wireless sensor is being installed it will be in test mode. The light will go on and off to test areas of motion that is being detected. This feature allows the wireless motion sensor to save battery life when it is not being tested. A hardwire motion light will blink any time motion is detected as long as power is available to the alarm system. For more about security systems call 1-800-310-9490. Related Video: How to change the battery in the most common motion sensor used.